It is beyond our wildest imagination seeing our little flower continue to take root and blossom. As we see the foundation continue to grow, Brent and I took a little jaunt north to Delaware for a little Bowling with Kpeasey Northern style. The rules are still the same with the goal being to knock down ten pins with two rolls and to spread inclusion far and wide, but those northerners sure do talk funny. As long as they continue to use words like inclusion, kindness, together we wheel and as long as their efforts are met with ear to ear smiles, we will get used to the amusing way those Delawareans speak. We brought Tina and Naomi Hicks along with us and we got to see good friends Preston and Deb Buenaga of Preston's March for Energy and participated in our second Fusion Inclusion 5K. It is an example of inclusion at it's finest with dozens of athletes enjoying two laps around Christiana Mall. Besides seeing the family who put on the bowling found raiser is was good to spread the message of inclusion that we continue to spread everywhere we go. It is exciting to see the little islands of KPF begin to spread in Atlanta, Delaware and Utah. Fusion Inclusion and Preston's March were gracious hosts as they always are. In between our trip and recruiting new athletes, Brent and I have been going to different groups around the Atlanta area to recruit so that KPF can continue to grow and evolve. As we turn the corner into the summer months we are gearing up for the largest 10K in America, the Peachtree Road Race. This year we have have our largest group of participants with ten teams. The teams include Sherry Adams and Brandon Clift, Naomi Hicks and Carrie Smith, Justin Knight and Chris Nasser, Ricardo Aranda and Matt Shechtman, Curtis Ward and Yvonne Leeb, Lizzie Kriskey and Rebecca Carpenter, Katy Freeseman and Krystle Andrews, Bentley Grace Hicks and Fred Soller, Kyleigh Kramlich and Scott Stafford and lastly yours truly with Brent Pease. We are stoked! We have many events leading up to the Peachtree including our summer gala; a celebration of the Peachtree athletes as well as our summer fundraiser event. I personally am super excited about this because the location is where I did therapeutic horse back riding as a kid. It brings back great memories and it allows me to witness the growth of the Chastian Horse Park which had such an incredible impact on my childhood. The event is being held on June 16. As this weeks blog comes to a close I encourage all to sign up for the Jake Vinson Family Grant and to look at our website for updated events and latest happenings around the Foundation. Guest blogger and Walking with Walking with KPeasey of Utah athlete, Joe Guttenplan, recently competed in the Ironman 70.3 with KPF athlete Curtis Ward. The two not only competed but completed this challenging event. Below they share their thoughts about their experience. As cliché as it sounds, the entire weekend far exceeded all expectations. It was incredible to spend time getting to know Curtis, his mom and the support crew (Brent, Mike, Jesse and Thomas). We all worked as a cohesive team to build a race plan that would work for all of us. Since I had never raced a distance greater than a 5k while assisting another athlete, I received a significant amount of helpful coaching from everyone in the camp leading up to the start of the race. The weather was perfect on race day and the support team and fellow Dynamo/KPeasey fans were out in full force. Without them, I anticipate a mighty long day. During the swim, Curtis and I made a few friends and were joined by an outgoing navigator on a kayak to help direct us through traffic. A little comic relief took place to quell the nerves, when Curtis experienced a few fellow racers, who grabbed onto his boat for a breather believing that he was a lifeguard there to help them. The first 3/4 of the bike portion was incredible. Curtis and I received encouragement and kind words of inspiration from athletes, who were passing us on both sides of the road. At the end, it was only Curtis and myself working as a finely tuned team to get the miles in on the bike. Curtis was a great teammate and provided both encouragement and friendly conversation to help push us through the last tiring laps. Without him I would have been toast. Once on the run, we received emotional pats on the backs from a vast majority of the racers, as they passed us on their way back to the finish line. I had to fix my right arm in a manner so that I was not only pushing the chair, but that I was able to give a sufficient thumbs up to acknowledge the constant positive affirmations from fellow racers. As much as I could have used that extra energy to propel us towards the end, I didn’t feel it was enough to simply nod a thank you. Thumbs up all around. The support crew showed up on bikes at a perfect time to give us a second wind as we reached the turnaround. Most racers had already passed us going the other way by this point, so it was great to have Thomas (and the Facebook live feed), Jesse, Mike and Brent there to cheer us on as we made our way towards the ultimate goal: the Finish Line. I had mentioned to them that my legs were starting to give out and my pace was slowing mightily for the last four or five miles of the run. Those last miles were a great example of what the Kyle Pease Foundation is all about. While nobody broke out into an inspirational “Where there’s a wheel, There’s a way” tribal chant, Curtis and the boys coached and encouraged the entire way home. They willed us to the finish. While having the team there to help was incredible for the Friday setup and in both transitions, my favorite part of the race was the last handful of miles as everyone pulled together to get us to the finish line. 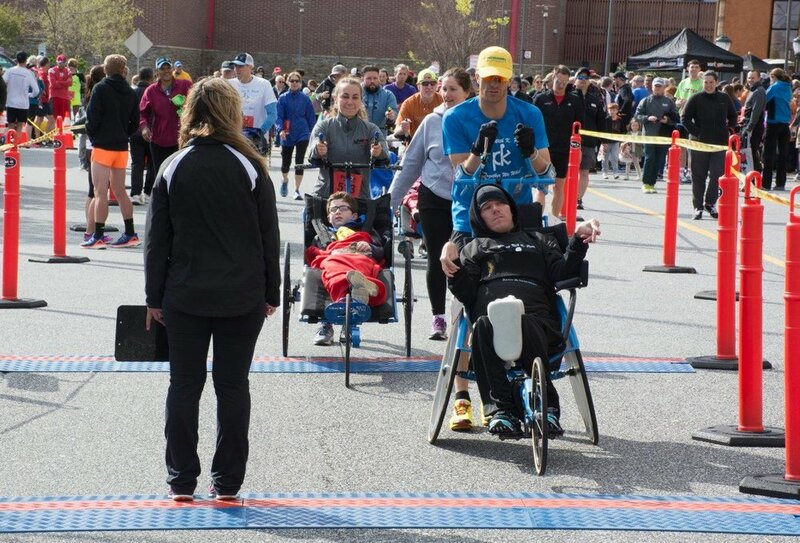 There was no greater thrill than hearing the loud ovation as my teammate at the wheel, Curtis, and I rolled across the finish line. Crossing the line by myself is pretty darn amazing; crossing with my teammate is beyond description. Curtis, a man of very few words except when he’s on the course, summed up our experience this way, “I had an unforgettable, life-changing time. The swim was fun because the other swimmers kept on bumping into me and Joe on the course and were trying to hang on to us like we were a rescue boat. The bike course was exciting to see all the other bike riders cheering us on, but the run was my favorite part because it had a food station at every mile. I may be exaggerating but I feel like we stopped to feed me 26.2 times along the way. That's where you see me with a big bag of chips, literally making it "all this and a bag of chips." I want to thank everyone associated with the Kyle Pease Foundation for allowing Michelle (my wife) and me to not only take part in this weekend, but for allowing us to start Walking With KPeasey in Utah. I’ve enjoyed working with Kyle and Brent while participating in a few races in Atlanta so having the opportunity to build a new chapter in Utah to extend the mission and purpose of the Foundation in our new home is absolutely surreal. Wherever we are, Together We Wheel.